Endlessly inventive and irreverent, Sausage Party is as rudely hilarious as it is surprisingly soulful. Anthropomorphic beings speaking English and acting like humans is a reliable high concept basis for many animated films. The new movie Sausage Party is, on the surface, pretty easy to grasp in that regard. You could call it The Secret Life of Food or Grocery Story. 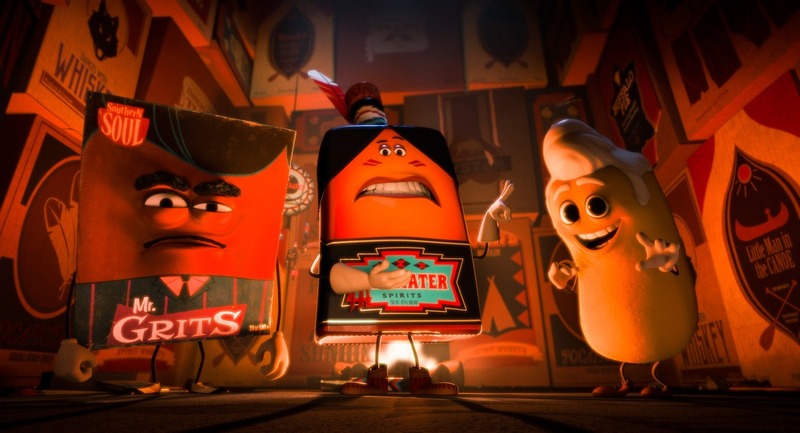 But what sets Sausage Party apart is the shocking amount of thematic depth it unexpectedly brings to the proceedings. 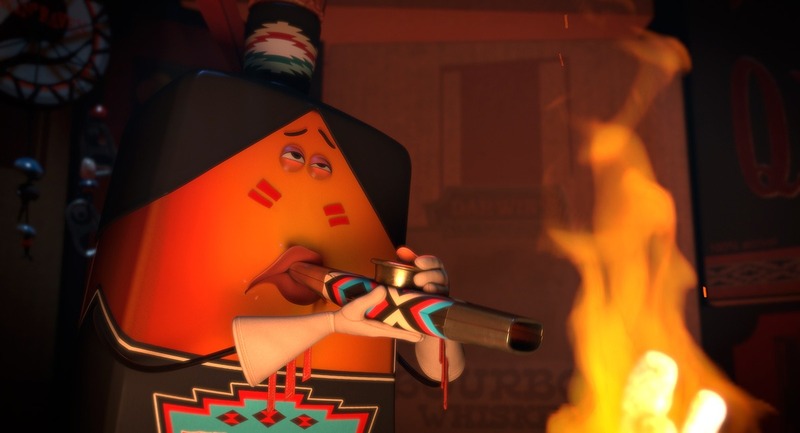 Despite being a movie where a pita bread’s scrotum is tickled by a bagel, Sausage Party is really an examination of faith and existentialism. Every item in a grocery store called Shopwell’s walks, talks, and prays every morning with an offering of song to the religious deities they worship. Human beings can’t see this behaviour, of course, but that does little to impede the food’s sense of existence and service to the will of something bigger than themselves. 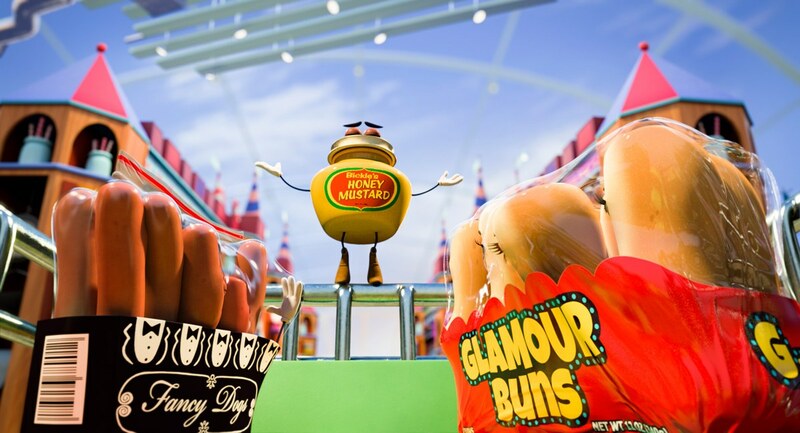 Our hero hot dog (he’s not even a real sausage) is Frank, voiced by Seth Rogen. Frank and his buddies Carl (Jonah Hill) and Barry (Michael Cera) live in their package on a shelf next to the comely buns they dream about placing themselves in. Brenda (Kristen Wiig) is Frank’s main squeeze from beyond the plastic packaging. They can’t just get it on, though; the “gods” (read: people) have to be the ones to select them for the journey to the “Great Beyond”, where all their carnal desires will be fulfilled. A shaken and scarred jar of honey mustard (the irreplaceable Danny McBride) is returned to the shelves and causes our characters to go from blissfully ignorant to existentially in crisis. There’s no eternity and happiness in the world beyond the automatic supermarket doors, Honey Mustard explains. There’s just pain, death, and suffering for all food items with extreme prejudice. Frank sets off on a mission to reveal the truth to every item in every aisle to prevent a potential food genocide – July 4th holiday BBQ parties. Jokes, puns, and sight gags fly fast and furiously through all of Sausage Party’s tight 88-minute runtime. An animated medium proves to suit Rogen and his usual band of merry men well, allowing them to venture into far more fantastical opportunities than they’ve had the opportunity to explore in the past. Rogen and his co-writer/co-producer Evan Goldberg previously mixed religious themes with frat humour in This Is the End, an apocalyptic parable about morality. This Is the End is one of the very best comedies of the last five years and even if Sausage Party doesn’t go that same distance years from now it’s still an immensely entertaining and singular movie-going experience. The animated characters look cute and friendly, yes, but they’re about as suitable for children to be around as a Chucky doll. Coming from the people responsible for Neighbors, Superbad, Pineapple Express et al. that’s really no surprise. Leave the kids at home – there’s just too much crude sexual humour and pervasive strong language to expose the Dory crowd to just yet. Beyond that, if they would even be able to comprehend what they’re seeing, kids would leave the theatre asking about the meaning of life and whether or not there’s a God or even multiple Gods watching over them. Explaining exactly what Mr. Grits (Craig Robinson) does to a box of crackers during the climax is easier than tackling those heavy themes with your kids. Sausage Party is a riot for appropriate audiences. Those who may be easily offended should perhaps look elsewhere for nothing is sacred here. Race, sexuality, and almost every religion under the sun take a beating in the name of a good giggle. Far more often than not, those jokes land with a punch and a guttural guffaw. There are missed marks, of course, as every comedy will have, but there are more gasp-worthy bits here than in any other comedy released this year. It’s raunchy and stuffed with enough thematic nutrients to satisfy viewers who might not normally be down with its amped-up outrageousness. Sausage Party is a buffet of laughs, shock humour, and raunchy wit that stands as one of the most creative original films of the summer.